Archived content is available via the browser-based Enterprise Vault search. A search result showing an archived document will display a static HTML rendering of the document as well as any attachments. The attachments can be easily downloaded. Once the content is archived, IBM Notes and Domino are no longer required to view the data. IBM, Lotus, and Notes are registered trademarks of the International Business Machines Corporation. Veritas is a trademark of Veritas. EZ Notes Search was originally designed to run on Microsoft® Windows® 7 and Microsoft Windows XP. 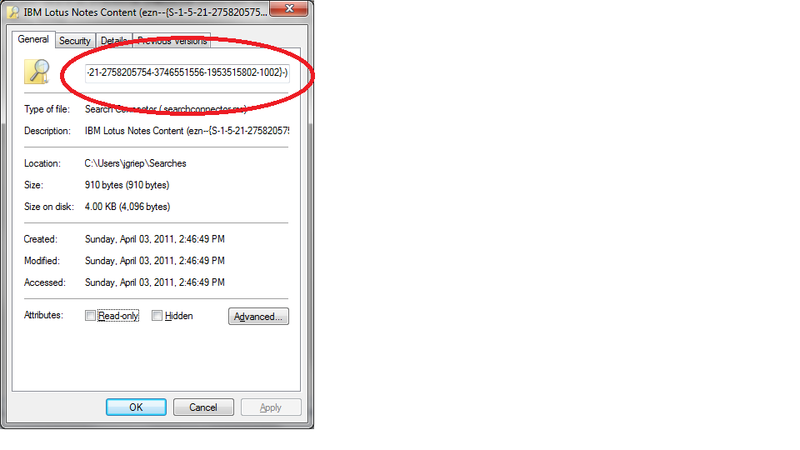 It is also supported on the Microsoft Windows 8 versions (with a slightly different user experience). EZ Notes Search doesn't work properly on Microsoft Windows 10 and is therefore not supported on that platform. One alternative to consider on Windows 10 is to use the native Notes search facility which can now search both mail and mail archives simultaneously. 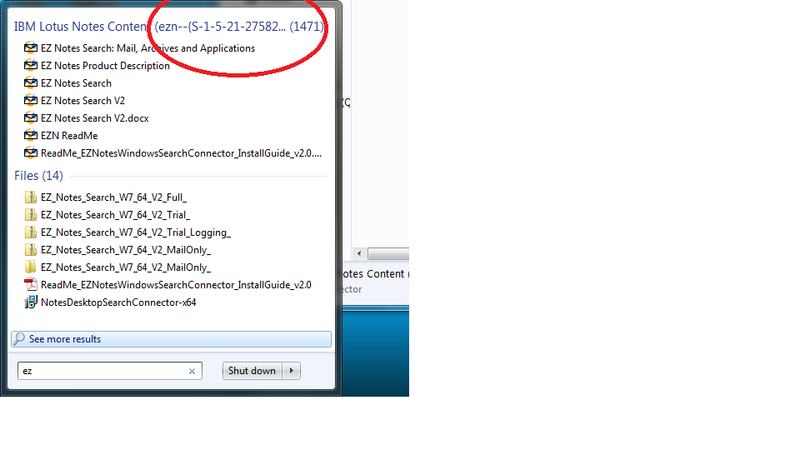 Open the EZNConnector application by clicking on its icon in the system tray. You should see the EZNConnector application restarted in the system tray. The amount of time to completely rebuild the index depends on how many files, IBM Notes databases, messages and attachments you have on your system. 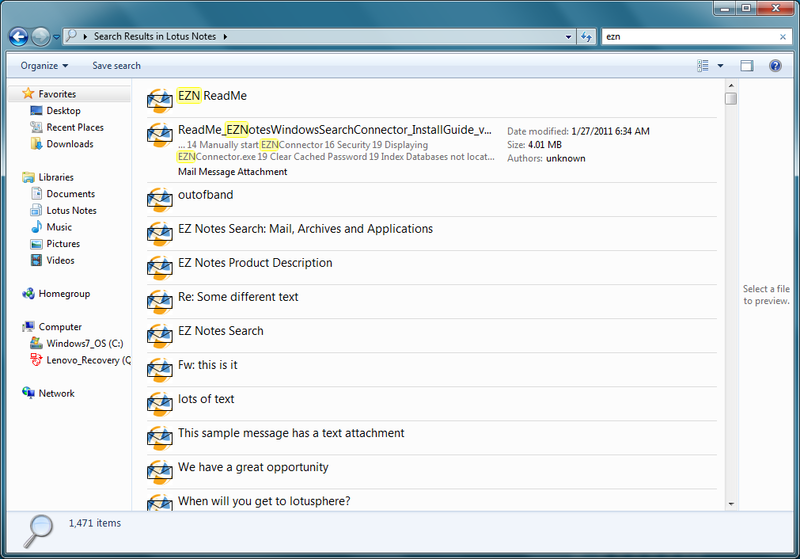 With Windows Search (and EZ Notes Search), you can easily filter your local database searches by Subject and then preview the result. You can also filter by To:, CC: and others. See this post for more details. 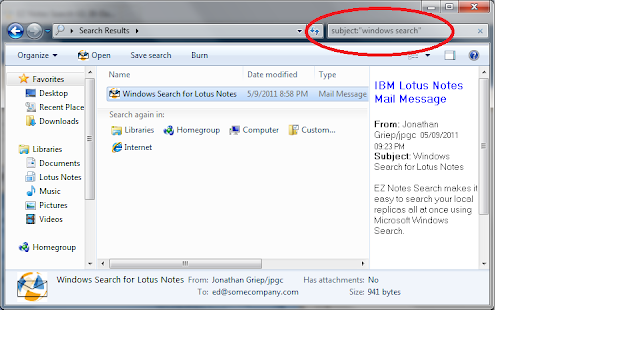 Windows Search will show you content from Lotus Notes and your hard drive. The heading for the Lotus Notes content leaves a little to be desired, so lets change it to something a little friendlier. Then click on the "Searches" under Programs. This will bring up a window with the list of Search Connectors that are installed on your PC. Now you can change the title to whatever you want. When you are done, click OK. The "Apply" button is always disabled for some reason. 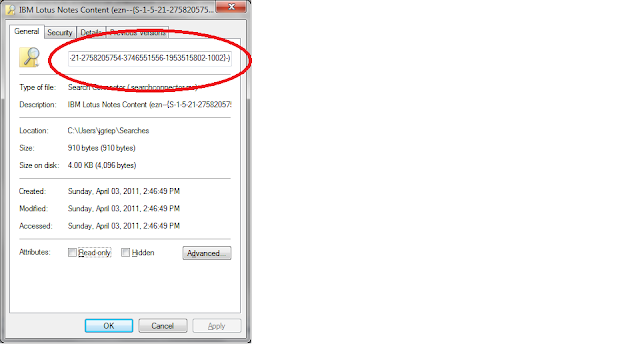 For this example, I changed it to "Lotus Notes". 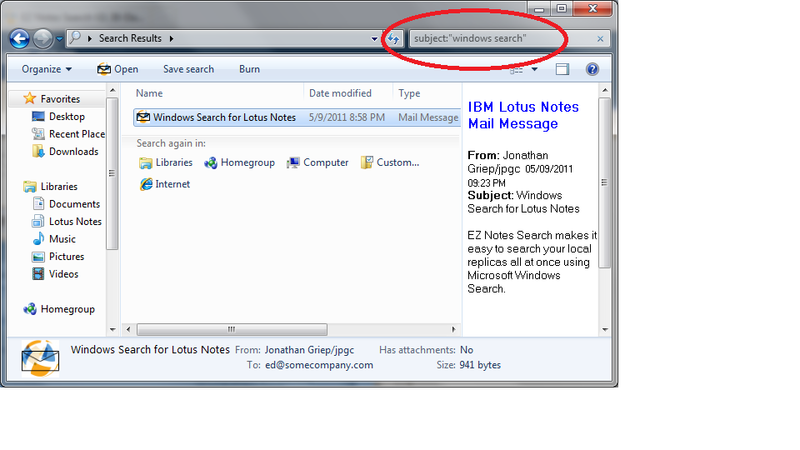 With EZ Notes Search you can quickly find a message to a particular person. In the search box simply type to:Tom and it will find all messages to Tom. Similarly from:Tom and cc:Tom work as well. 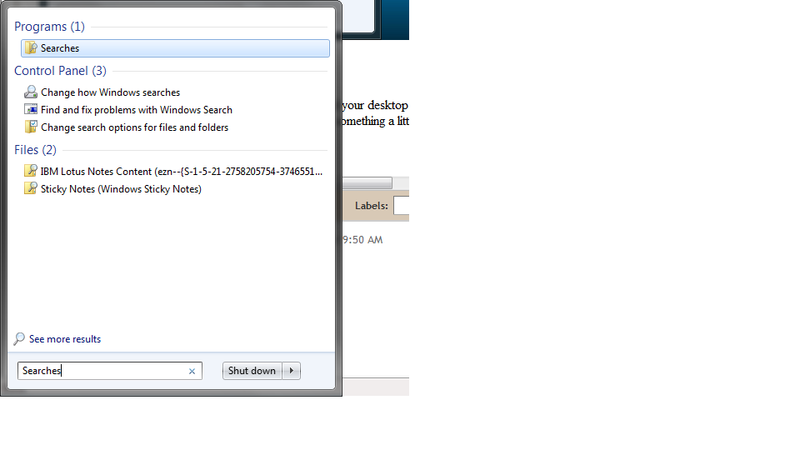 You can type a portion of their name, say To:Smi and Windows Search will match all messages with "Smi" in the To: field. All the results will appear as you are typing the string so the more characters you type, the more the results will be refined. There are other filters you can use as well: Advanced tips for searching in Windows. EZ Notes Search V2 currently supports the following fields: System.ItemNameDisplay, System.ItemType, System.Author, System.Kind, System.Size, System.ItemFolderPathDisplayNarrow, System.DateModified, System.Message.FromName, System.Message.HasAttachments, System.IsAttachment, System.FileName, System.ItemPathDisplay, System.ParsingName, System.Calendar.Location, System.StartDate, System.EndDate, System.Message.DateReceived, System.Message.ToName, System.Message.ToAddress, System.Message.CcName, System.Message.CcAddress.